At Windes, our audit reporting and financial analysis approach combine experience and an in-depth understanding of your business and industry to deliver independent, quality information to help you run a better organization. We establish hands-on, year-round relationships with our clients in and around Southern California, utilize outstanding professionals and the best in training and technology, and demand excellence in each engagement. We have designed our audit reports to drill down to the pertinent data, which allows our partners and professionals to ask critical questions that can provide insight into important trends and enhance the value of the financial analysis. The primary objective of each audit report from our Southern California firm is to express an opinion on the fair presentation of a client’s financial position and operational results. Audits involve identifying risks, financial analysis review evaluating internal controls, and testing financial transactions. To add the most value to our audit reporting, Windes’ management letters not only address internal control matters, but operational and efficiency issues, as well. Clients also benefit from the computer systems, analytics, and processes we use to ensure the accuracy and validity of their financial data. Windes relies on experience and our expertise in many industries. All of our Los Angeles, Long Beach, and Orange County auditors offer a wealth of experience, with many specializing in specific industry sectors. 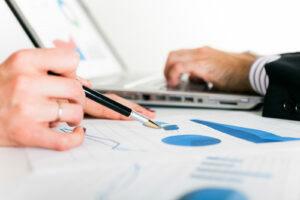 This allows us to perform each audit report and financial analysis with a unique, value-added insight. Windes also offers compilations and financial analysis as part of our comprehensive services. Compilations involve compiled financial statements in accordance with professional standards. No opinion is expressed regarding financial information. Going a step further, financial analysis reviews include making inquiries of management and performing analytical procedures. We prepare formal reports for both types of engagements.